When you are looking for a food processor to be your trusted friends in the kitchen, Cuisinart must be considered. The best Cuisinart food processor is not exactly a difficult find. The brand has been around for ages and has had their share of good and bad reviews, of satisfied and unconvinced customers. References are everywhere if you look for them. And we have done just so! After digging around for quite a bit, the following products are reviewed as most worth-considering, offering the best prices with adequate functions. Here are the candidates for the Best Cuisinart Food Processors. To pick up a decent machine with the best price on Cuisinart food processor category, one simply can’t ignore the Custom™ series, especially with medium and large builds. The series is the most successful line of food processors from Cuisinart and is currently one of the top recommendations in Kitchen Small Appliance category on multiple online retailers. Let us first take a look at the almost $200 Cuisinart DFP-14BCNY 14-cup, the large. In contrast to the other collections, the Custom ™ highlights traditional values. Featuring physical paddle controls instead of electronic touchpads, Custom ™ models steal the heart of users with simplicity and familiarity in designs. Custom ™ units have two paddles controlling the spinning: the ON and the OFF/Pulse paddle. The ON mode will keep the motor running continuously until stopped with the OFF paddle, or until the lid or the large pusher is removed, which is a safety feature. The fact that these units don’t have multiple speed choices does seem to be non-versatile. However, according to many experienced owners, various speeds are not as useful as they initially thought. They usually find themselves accustomed to only one speed mode and pulsing. From a personal perspective, one fixed velocity is effective enough. The docking is standard as the bowl locks into the motor base with a simple turn counterclockwise. The lid uses the same mechanics as we can lock/unlock it by only twisting. Nothing too strange. However — and here’s where I need your attention, regarding the feed chute, the Custom ™ 14 Cup offers two feeding options: one small tube for small vegetables produce and one extra large feed tube and large pusher for big, round veggies and fruits. The small tube goes together with a small pusher, which offers one more feature. The small pusher has what they call a drizzle hole. What it does is allow any liquid to drop through at a moderate pace and thoroughly incorporate into your mayonnaise or vinaigrette. The cool part of the work bowl is the hidden safety feature: the motor can only be activated once the lid or the large pusher has been locked in. As soon as you twist them out of place, the machine will cease to operate immediately. As a model from a standard, classic line of food processors, the DFP-14BCNY offers tools suited for probably all of your daily kitchen needs. A stainless steel chopping/mixing S blade is included to help you puree, chop vegetables, mix/knead doughs and grind nuts, seeds or dried fruits. Apart from the blade, the package will also include a standard, stainless steel slicing disc (4mm) to cut up your produce into even slices in an instance, and, of course, a shredding disc to let you shred your potatoes, carrots or even cheese with ease. The Custom ™ 14 Cup, overall, is not designed with complexity. So rest assured that it won’t take you long to take the unit apart to clean and store it away. The design consists of 3 big essential parts: the motor, discs/ blade, and the work bowl/ lid, in which the assembling/ disassembling of the lid plus its pushers requires some getting-used-to. The stem that goes along with the discs also has a bit of a learning curve to be attached properly. You need to know where the cue symbol and the locking switch is, and which way to twist the stem. It’s truly not as complicated as it sounds. Once you’ve seen how each part works, it won’t be a problem anymore. Finally, it’s worth mentioning that all the parts (except for the motor, maybe) are dishwasher-friendly like your typical kitchenware. A little notice: watch your hands around the blade/ discs. As you switch between them or put them in/ get them out of your dishwasher, always hold the discs by their edges and the blade by its hub. They are nail-cutting, razor sharp. The unit is covered with a full 5-year motor warranty and a limited 3-year warranty on the entire unit. The other unit that has scored many consumers for Cuisinart is the medium size of the same Custom series: the Pro-Custom 11-cup. To get a general idea of the machine, think of the Pro-Custom Cuisinart 11-cup model DLC-8SBCY as a combination of the Custom ™ 14-cup and a Mini-Prep 4-cup mini processor, which we will be discussing down below. Coming from the same series, the DLC-8SBCY 11-cup, about $30 cheaper (on Amazon) is very similar to the larger model. They look alike and operate with the same mechanics from the work bowls to the motor base. Still, here is why it is a different machine from the 14-cup, not much in form, but in usage. The Pro-Custom 11-cup is with an extra compact flat cover with one drop-in hole, contrasting with the 14-cup, which makes thing less complicated if your daily demands in the kitchen don’t often include shredding/ slicing ingredients. When you want to use the discs to shred/ slice, the heavier, more space-occupying default cover with feed chute is required. Thus, in scenarios of only chopping, mixing, pureeing, the compact flat cover of the 11-cup unit will prove to be much handier. Plus, when the feed chute is only occasionally needed, the compact cover will be the frequent component going outside and inside storing space with the machine. Meaning, the whole unit can be stored with less room for regular use. Now as to why the item is half the 14-cup unit, it has a thing to with the slicing disc. Unlike the Custom ™ unit, the Pro-Custom DLC-8SBCY 11-cup offers, not one, but two slicing discs: a thin (2mm) and a medium (4mm) slicing disc. The addition allows users extra-thin slices for garnishing purpose or preferred serving size. The unit, similar the the large unit, is covered with a full 5-year motor warranty and a limited 3-year warranty on the complete set. The medium and large bowls are meant, to some extent, for complete dishes. But if you’re only looking for a machine that can assist with daily normal food prep tasks, the small bowl franchise is a fair consideration. For such casual demands, the Mini-Prep ® Plus series with touchpad controls, even though introduced quite a while ago, is still a big hit in many kitchens. For today break-down, we chose the Mini-Prep ® Plus 3 Cup, our pick for the best small food processor, to be the subject. As opposed to the less popular Mini-Prep ® models which have paddle controls, the Mini-Prep ® Plus adopts the more modern experience with touchpad controls. With much, much less pressure on the buttons, oil from your fingertips are to be less imprinted, resulting in easy-to-clean marks if there were any. The unit of discussing has two operating modes, one for chopping/mixing soft ingredients and one for grinding nuts and such. The “work bowl”, or work cup I should say, is nothing too fancy. Standard Cuisinart safety mechanism and turn-to-lock for the cups and lid are expected. The lid has two small holes to gradually drip in oil and liquid mid-process of making vinaigrette, mayonnaise or similar tasks. These mechanics allow any liquid to incorporate within the mixture more evenly, producing finer final products. There is also a larger version, the Mini-Prep ® Plus 4 Cup. Though the 3 cup version is more popular, they are fundamentally the same machines featuring differently sized work bowls. Most mini food processors from Cuisinart provide only one blade for chopping/mixing and grinding, as there are no needs for switching blades between said processes. The auto-reversing SmartPower ® blade with sharp edges to chop/mix/ puree soft produce and blunt ones on the other side to grind will get all the actions done without replacement of the blade. When users choose to chop, the blade spins in one direction using the sharp edges. Meanwhile, the blade will spin the opposite direction exploiting the blunt edges for hard texture ingredients. However, according to several critical reviews, the Mini-Prep ® Plus series is apparently not up to the task of grinding. To be more specific, the powder resulted from the process is likely to be breathed out from the unsealed cups. Aimed to be compact and easy to use, the Mini-Prep ® Plus 3 Cup mini food processor is built at extreme simplicity. One twist for the work cup and one for the lid, we’re all done. Cleaning will also take next to nothing regarding efforts because of its dishwasher safe nature. Notice: Always be careful handling the blades in food processors. 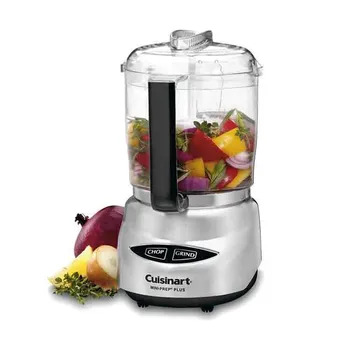 Limited 18 month warranties covers every mini food processor from Cuisinart.